You can see more information about the chain at the bottom of this post. I have also blogged extensively about teaching reading skills with pictures, which you also see here! Then I listed some events and used sticky notes to come up with causes and effects of those events. 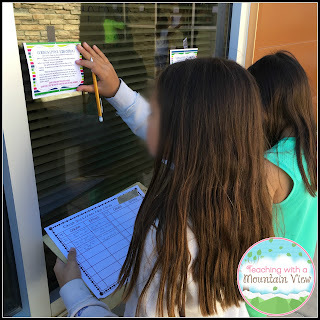 It was such a great way to introduce and review this skill. 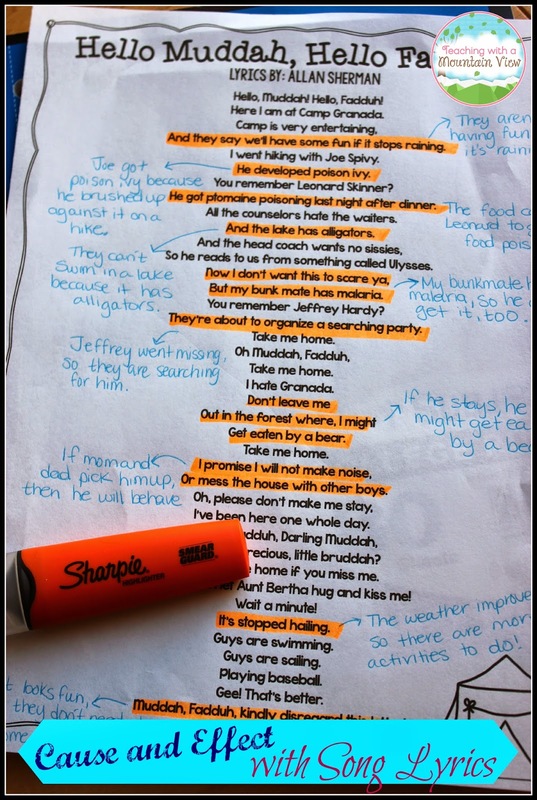 Then came the fun part--song lyrics! Now, before I go on, I have to give my dad total credit for coming up with this song! Do you know how hard it is to find a song that tells a story and is appropriate for elementary school kids? It's not an easy task! We ended up using Hello Muddha, Hello Faddah, the old camp song by Allan Sherman. You can download a copy of the lyrics I used HERE. The kids got such a kick out of this song, and it's pretty harmless. You could even let them listen to it a few times. We had a great time looking for and generating cause and effect relationships. 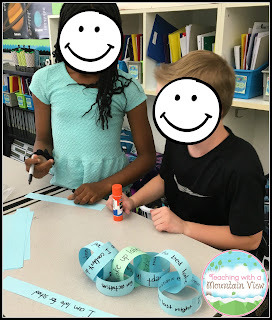 I loved using the song because not only were we finding explicitly stated cause and effect relationships, but we had to do some inference as well. 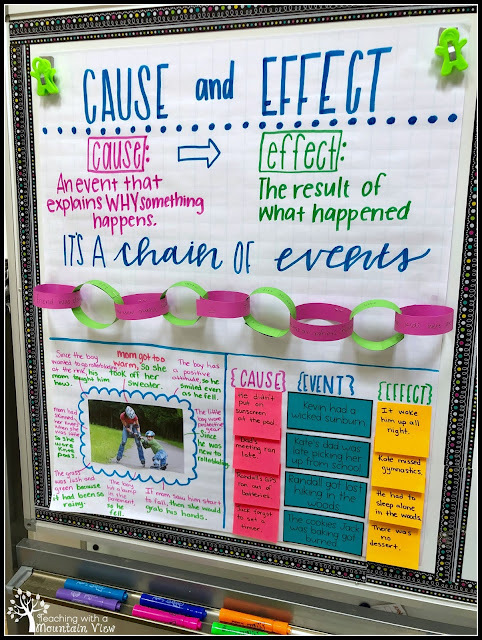 After we pulled out as many cause and effect relationships as we could and annotated the paper (a little bit like we would with a close reading passage), we turned it into a foldable in our interactive notebook. You can see the outside of it here, and on the inside we wrote the effect. This challenged their thinking a bit because some of the annotations we made were written with the effect first and the cause second. 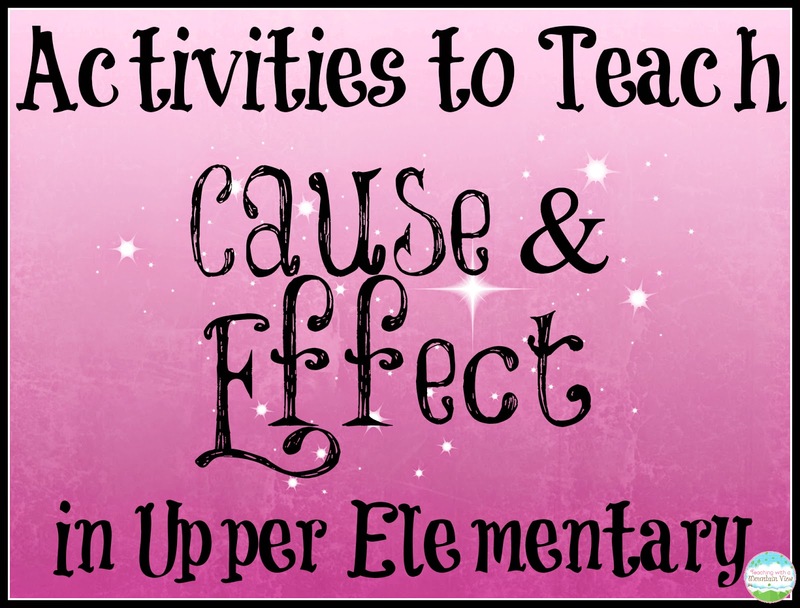 It was perfect to get them thinking about the different formats of cause and effect! My students are very comfortable using pictures to practice reading skills, so I had them use their left side to find cause and effect relationships in a picture. This is always a hit! If you would like to download the templates we used for the right hand side of the notebook as well as the picture we used for the left hand side, you can do so HERE. Next, I used my Generating Cause and Effect Task Cards for their cause and effect interactive component. 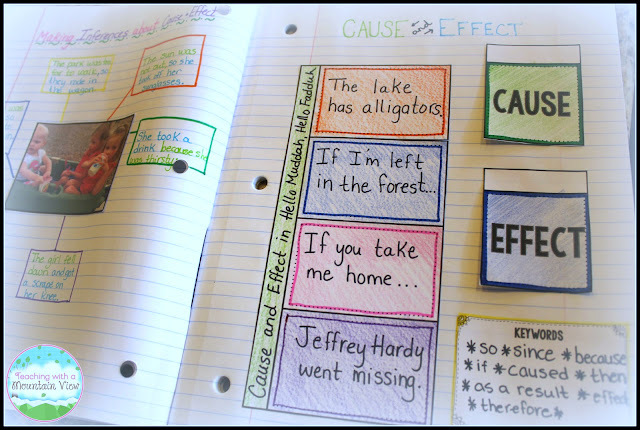 We used a modification of the Thinking Maps cause and effect map, as seen below. I printed out the task cards at 50% their original size and gave each student four to glue in their notebooks. 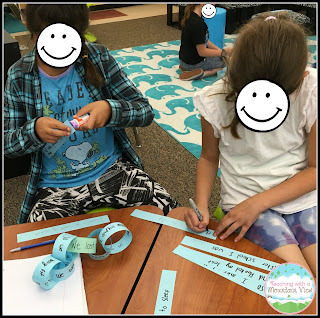 They wrote the cause and effect relationships and shared with a neighbor. 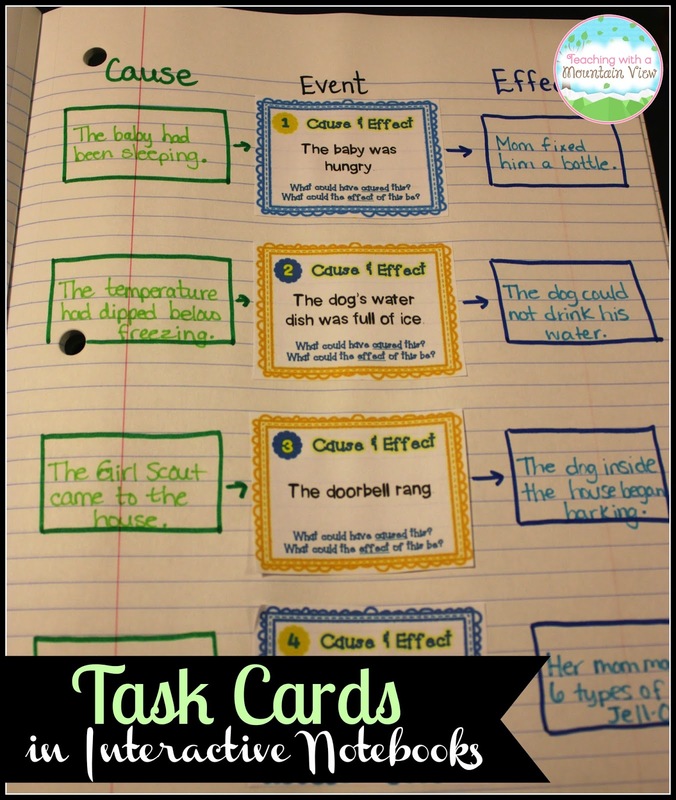 I LOVE using task cards in interactive notebooks this way! I wanted to throw in a super engaging "competition" element to this lesson, so I had them create cause and effect chains. I gave each partner group a small strip of paper that had an event on it. Then, they had to create chain reaction cause and effect stories based on the event. This was really challenging because they had to create a CAUSE and EFFECT for the event, and then go backwards to create the story. Basically, the event I gave them had to end up in the middle of the chain, with events leading up to it, and events following it. I only gave them 15 minutes to do as much as they could, and they had a blast! Our next step was to apply these skills to deeper texts. 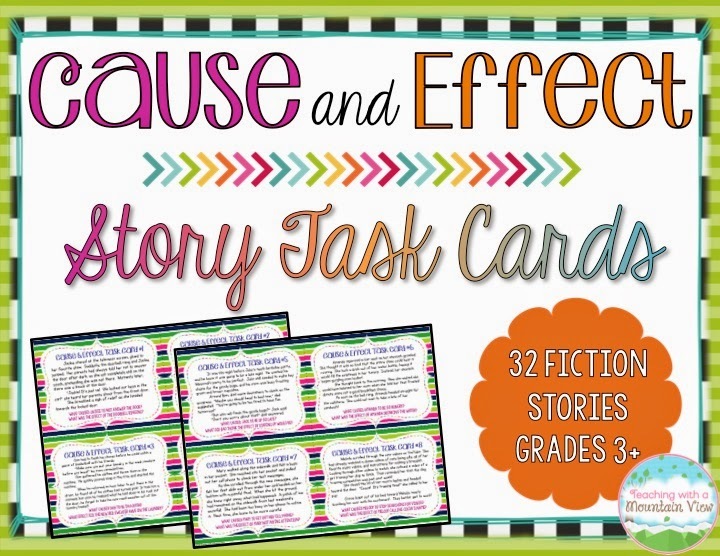 We used my cause and effect paragraph task cards to practice the skills! It was a beautiful day, so I took the students outside, and spread the cards out all over one area. I mixed them all up so that they would have to move around to find their next card. They LOVED this! All of this only took about two days, which was perfect for us! I needed a quick review, and this fit the bill. Do you have any great cause and effect activities to share? I love how you taught the same skill in so many different ways. A great music video for students to see cause and effect is OK Go's song "This Too Shall Pass" (with totally appropriate lyrics). It is visually amazing. 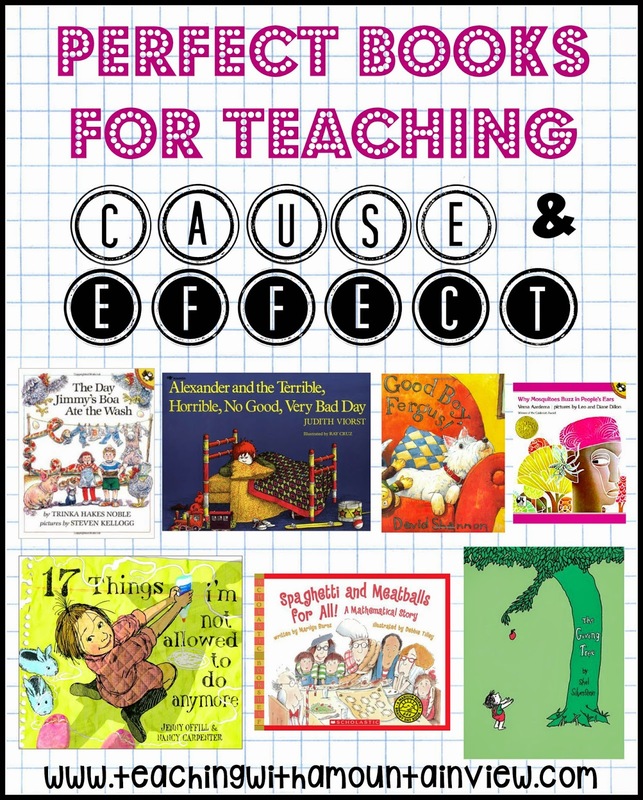 I love cause and effect, and I am so happy you included books beyond the typical If You Give a Mouse a Cookie series. I also love to use the story Grandpa's Teeth when I teach cause and effect. The kids think it is really funny, but they also get lots of chances to practice this critical skill. Random question for you, what add on gave you the awesome Email Update and Social Media buttons on the bottom of your post? I love it! Thanks for your note. To be completely honest, I haven't got a clue what add on that is! Michelle from The 3AM Teacher did all the coding on the site, so she may be able to help. Thank you post, thank you !